This ride makes the third and final installment in our Bay Area mountains series. 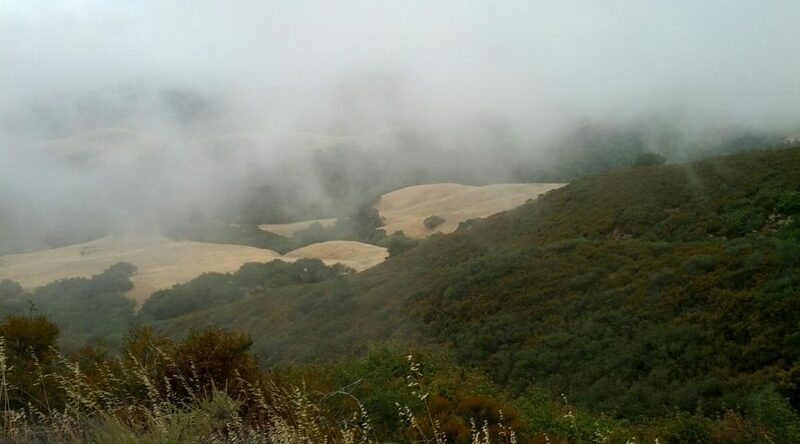 Two weeks ago was Mt Hamilton, last all was Mt Diablo, and this week was Mt Tamalpais. Even though this was the lowest summit, I think it was the hardest ride. First off, the heat. We got a fairly early start, but it was still 75 degrees already when we started rolling at 8:30. Temperatures were in the mid 90s before we were done. Climbing out of Mill Valley we hit a surprisingly steep grade before we had really warmed up. We needed to walk up some of it, then I took an early turn with the trailer, and still with all the bags. Mt Tam has a sneaky approach to the East Summit. You climb and climb and see a bunch of communication gear and think you’re just about at the top. But then you turn the corner, and see that you need to descend down, follow the ridge line, and climb up to the next peak. Then you do the same thing again. Finally you get to the real East Summit, although you can’t bike all the way to the top. I took the trailer back for the descent. Of course that meant some short climbs, too. It was too hot and too soon after lunch for me to handle it well. Anne helped a bit, until we got to the real descent. There were still a few short climbs, but mostly we could just coast back up them. 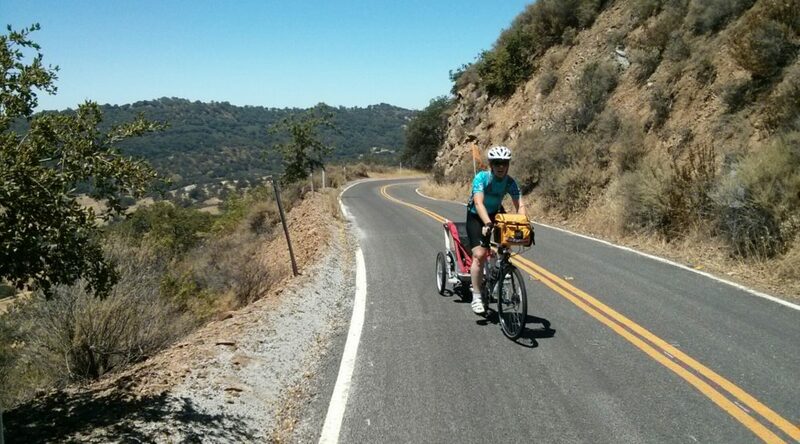 We made it down to the Alpine Dam, and Anne took the trailer back for the next set of climbs. Just as we were crossing the dam, I noticed a funny dinging vibration coming from my rear wheel. We stopped to investigate, and figured out it was the spring in my brake pad bouncing off the rotor. I had worn a hole through the pad, and the spring poked through it. Fortunately enough, just the day before we went to the bike shop and bought spare pads and were shown how to install them, and I tossed the spares in the bag that morning. We weren’t able to get the brake fully adjusted, but we’ll enough. I knew I had reduced braking power, so I made Anne take the trailer for the rest of the descents, which she handled nicely. At some point, my cleats started popping out of my pedals, too. That meant I couldn’t pull back in my shoes, so my toes were really sore by the end. I guess it’s time for new cleats. This week was up Mount Diablo. Anne pulled the trailer the whole way up, which really impressed me. Overall, I’d say Mt Diablo is harder than Mt Hamilton. It’s not as tall, but the grade is less steady and definitely gets steeper. There’s a section right before the summit which is 13+%. We walked for that bit. The weather was cooler than the last couple of rides, which was nice. Above about 2500 feet it was foggy and windy, which wasn’t so great. The fog was thick enough that the pine needles dripped rain onto whatever was below. It was kind of cool to watch the fog roll off the hills and cliffs. Animal sightings: not much.. some bluebirds, a deer of in the distance, plus some stuffed animals (both real and toys) in the museum/gift shop at the summit. 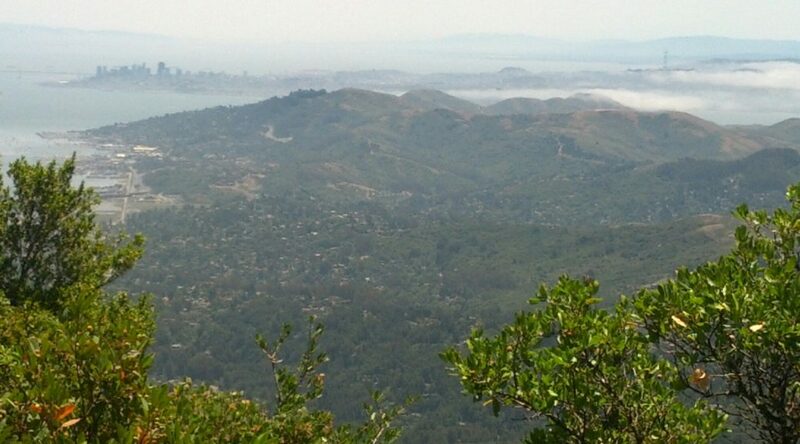 Next week: Mount Tam to complete our Bay Area mountain trifecta. I was really worried about this ride. First, I was worried about the roof rack failing again. Second I was worried about doing 4500+ feet of climbing with just two short descents to break it up. We have an even bigger sustained climb planned in Oregon, and I was afraid that we’d do this one and say never again — or worse, give up entirely. But somehow we made it all the way to Lick Observatory. Anne pulled the trailer most of the way up. I gave her a couple of short breaks, but I was carrying a full pannier load. Then I took the kid for the way back, but downhill is easy. We could see the observatory from the distance. When we started getting closer, it was actually demoralizing. When you’re doing a climb, seeing the car that just passed you even 20 feet higher on the other side of a switchback is hard. Seeing the obervatory 500 or 1000 feet higher is tough. But you keep going and get there. This ride had a pretty steady and manageable 6% grade, although I think I was starting to feel the thinner air towards the top. We may need to rethink our food plans. Anne carries the day’s supply of Clif bars and Gu in her handlebar bags. Part of my training load is a second day’s supply in a pannier. We had to dip into my stash. Yay, more weight! Animal sightings: Deer (including one that ran out across the road right behind us during a rest), a horse chillaxing with some goats, a herd of cows trying (and failing) to all fit in the shade of one tree, woodpeckers, turkey vultures, ground squirrels, a motorcycle dude with a fuzzy helmet, and a lost dog wandering in the street. Mechanical problems: My front derailleur isn’t quite right, but at least the chain stayed on.